It's time for the bride and groom to wed - if they can make it down the aisle. Roxy gives Aleks an ultimatum. Abi is devastated when Ben delivers some shocking news. Upstairs in the Vic, Shirley hurriedly stows the gun in a plastic bag as a worried Aunt Babe checks on her. Outside in the wedding car, Ian repeats that he won’t let Sharon marry Phil. Mick’s frantically trying to replace the destroyed wedding cake when Sharon hurries back inside and upstairs, Ian in tow. At the town hall, Phil pales on seeing Shirley pull up in a taxi and sends Ben inside. Phil insists he’s chosen Sharon – they’ve told each other everything. Shirley wonders if Sharon knows about her and Phil and brandishes the plastic bag containing the gun - she could show Phil something to change his mind about Sharon. Shirley thinks Phil’s only chosen Sharon because she said couldn’t have her and Ben. She declares she’ll leave Phil alone if he can tell her they won’t always choose each other. Phil won’t answer. In the Vic, an antsy Mick hovers outside the living room. Babe’s worried that Shirley’s responsible for the delay. Meanwhile, Sharon protests at Ian’s objections to Phil, pointing out he supported Ian after Lucy’s death. Ian’s shocked to realise Ben is out of prison and declares he won’t let Phil destroy Sharon the way he did Kathy and Ben. At the registry office, Billy thinks Shirley should accept that she’s lost. Shirley heads back to the Square, desperately hoping that she’s done enough. In the registry office, the wedding party wait anxiously for Sharon. 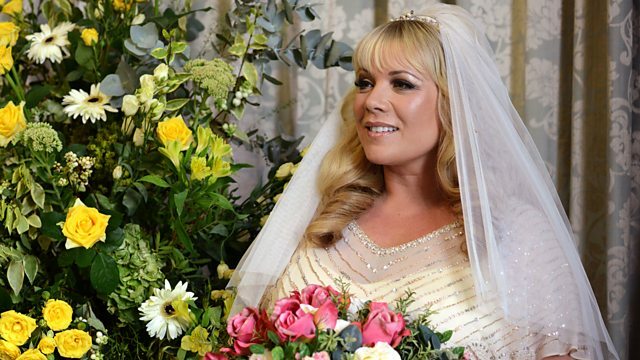 In the Vic, Sharon asks Ian to come with her to the registry office to face Phil. Ian’s hopeful he’s changed her mind. Shirley arrives back on the Square, delighted when Aunt Babe informs her that Sharon’s been delayed. Meanwhile, Ian and Sharon arrive at the registry office. Ian realises he’s been duped when Sharon asks him to give her away. Sharon admits neither she nor Phil were going to go through with it but now they trust each other. At No. 27, Ronnie tells a stunned Roxy that she’s 5 months pregnant. Roxy deduces Charlie’s the father, just as Aunt Sal enters with Dot and Fatboy. Ronnie conceals her baby bump while Roxy packs Amy off to the wedding with Fatboy. Ronnie forbids Roxy from telling Charlie and determines to raise the baby alone. Roxy thinks Ronnie’s scared. Ronnie’s irked that Roxy’s meddling in her life when her own is so perfect; Roxy’s face drops. Roxy admits Aleks is married. Ronnie’s outraged and thinks Roxy needs to face her problems head on. On the market, Aleks is plagued by calls on his mobile. Roxy marches over and demands he prove he’s serious about her. After another phone call and an angry exchange in Latvian, Aleks impulsively tells a surprised Roxy he wants to take her away on holiday. Later, Roxy insists it’s time for Ronnie to face her own problems and leads Charlie into the kitchen. After seeing Lauren and Dean loved up on the market place, Peter refuses to attend the wedding reception. Fed up, Cindy beseeches Lauren to convince him. Lauren shows Peter the posh hairstyle Dean’s given her for the party; Peter remarks that he prefers her hair loose. As she heads for the reception, Lauren lets down her hair. Abi’s irked when Aunt Sal thinks Lola is Jay’s girlfriend. After the wedding, Ben takes Abi aside; he doesn’t think it was Sal’s mistake – it’s obvious that Jay’s in love with Lola.